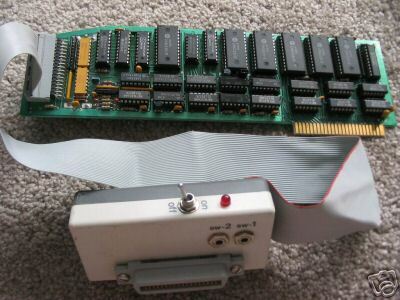 APPLE II CARD What is this card? I found this on eBay, and I have the very same card. It came out of a computer from a school. There is no label or identifying marks on it. What does it do? It's a type of adaptive firmware card. I forget the brand, but the box is interface for switches and controllers. It could also be used as sampler interface with the right software. Well thanks people. I now know what one of those strange cards in my collection are. If anybody needs this card Email me at . I would let it go for shipping. If anybody has the software disk for ramworks III email me.